This speaker works with tablets, smartphones, PCs and other devices that support Bluetooth or 3.5 mm audio output. Turn up the value. 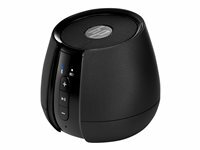 The HP S6500 is a portable speaker that combines great audio with impressive features. Stream your favorite sounds, and enjoy high-quality audio anywhere.